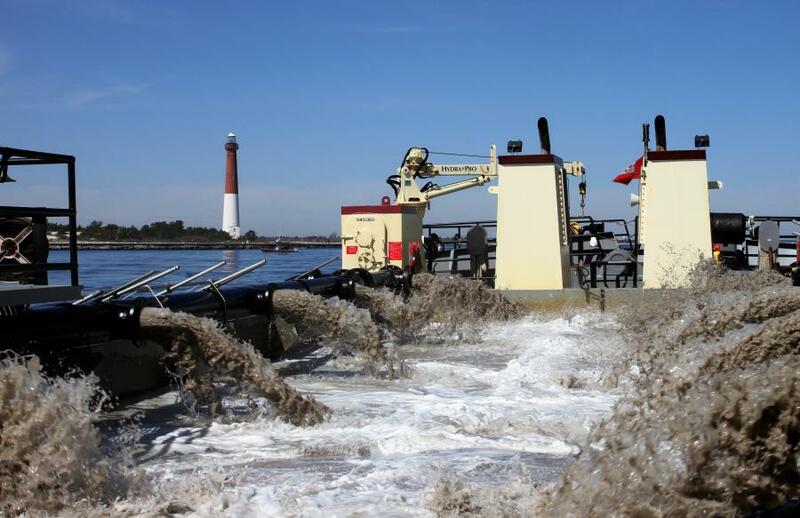 New Jersey Department of Transportation (NJDOT) officials announced State navigation channels in the Barnegat Bay Inlet area have been restored to navigable depths for the first time since Superstorm Sandy following the completion of a dredging project in Ocean County. Many of these channels had been shoaled in since Superstorm Sandy, limiting boating options, emergency response and commercial vessel traffic in the area. These channels are now considered to be in a state of good repair for the 2018 boating season and will provide access to enhanced recreational and economic activity for summer visitors and residents alike. The $8.7 million project in Forked River and Barnegat Bay restored the Double Creek Mainland, Double Creek Inlet, High Bar Harbor and Barnegat Light Stake State channels. This project began in early October with work taking place 24 hours a day, seven days a week when weather and other conditions permitted and was completed on time by Dec. 31, 2017. These channels are in addition to the Forked River channels which were dredged in the late summer and fall of 2017 as part of a $2.5 million project. Overall, the state removed more than 135,000 cu. yds. of sediment from the Barnegat Inlet and Forked River Complexes. Double Creek Inlet Channel had been closed, and commercial, sailboat and general recreational traffic had been severely limited in some locations since Superstorm Sandy. This project will ensure renewed safe navigation and maintain these Barnegat Bay Channels in a state of good repair. Boaters in the Double Creek Mainland, Double Creek Inlet and High Bar Harbor Channels will now be able to enjoy at least 7 ft. of water at mean low tide (MLW). The 95,000 cu. yds. of sediment removed from these channels was pumped to the newly acquired Oyster Creek Confined Disposal Facility (CDF) in Lacey, N.J.. The deep freeze in December 2017 prevented the contractor from fully restoring the High Bar Harbor Channel to the complete project depth of 7 ft. NJDOT worked with regulatory agencies to schedule a time to continue dredging about 1,800-ft. of this channel from its current depth of 4.5 ft., before summer, however a waiver to finish the work was not granted. 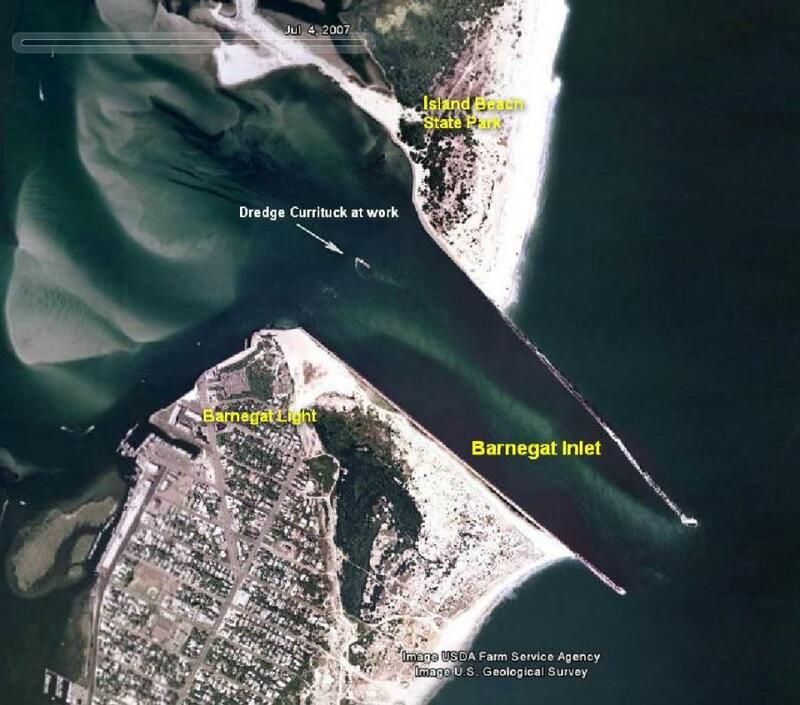 Barnegat Light Stake Channel users can now expect at least 5 ft. of water at low tide. The 6,000 cu. yds. of material from this channel, and a small portion of the Double Creek Inlet channel, which consisted of greater than 90 percent sand was placed on the Lighthouse Beach at the request of the Barnegat Light State Park. Boaters in the Forked River area will find that five channels have been dredged to project depth: Forked River (7 ft. at MLW), Forked River Middle Branch (5 ft. at MLW), Forked River Middle Branch Spur (5 ft. at MLW), South Branch Spur (Elks Channel) (5 ft. at MLW), and South Branch Spur (5 ft. at MLW). Approximately 35,000 cu. yds. of sediment was removed from the channels and placed in the Oyster Creek Confined Disposal Facility (OCCDF). The contractor, Great Lakes Dredge and Dock, experienced numerous challenges with weather delays, differing site conditions and equipment and was able to make the necessary adjustments to keep the project advancing with minimal impacts to boaters and residents to complete on schedule. Following Superstorm Sandy, NJDOT in March 2014 announced a comprehensive State Channel Dredging and Emergency Response Program to ensure and maintain safe navigation statewide, and to continue to be able to respond adequately to waterway impacts from named storms.